Last time, I talked about Flour-Corn Tortillas. Once we made those for the first time, it was only a small step to thinking about making our own chips and taco shells. Turns out it’s really easy (but probably not a great summertime recipe since it uses the oven and heats up the kitchen). The neat thing about doing your own taco shells is that you can do the same thing as with the chips – brush them with a bit of oil and sprinkle any kind of seasoning you want. With the flour-corn tortillas, neither tostadas or taco shells seem to be prone to cracking and spilling the contents all over you like with plain corn. I can’t say that we’ll never buy taco shells again… but it’d be a real challenge to put them in the cart. These are so much better! Preheat oven to 350F. Cut into wedges and arrange in a single layer on a baking sheet. Mist with non-stick spray or lightly brush with oil, then sprinkle lime juice and salt evenly over all. Bake for 7 minutes then rotate pan and cook for another 7 minutes. The chips should be starting to brown. Remove and let cool, they will continue to crisp up. Ideally, cook the tortillas only halfway so they’re still somewhat raw but not sticky – about 30 seconds per side. For Tacos: Remove one of the racks from the oven. Preheat the oven (minus the rack) to 350F. Carefully place each tortilla so that it hangs over two bars of the rack. It’s okay if the edges touch, they shouldn’t stick together. Re-hang the rack in the oven, making sure you place it high enough that the tortillas don’t drag or touch the other rack(s). For Tostadas: Brush tortillas with a bit of oil, sprinkle some seasoning or salt over, then simply lay them flat on the pre-heated oven rack or on a sheet pan. Bake for 10 minutes and check. If they are turning brown and seem hard enough, go ahead and remove them. If they’re still soft-ish, let them bake for another few minutes. 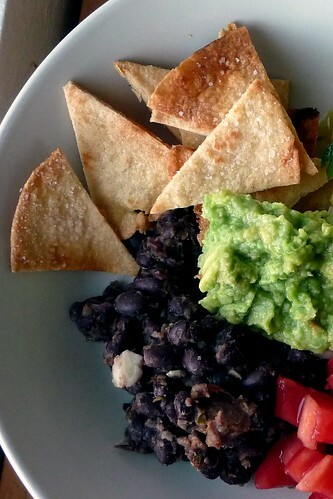 This entry was posted in mexican, recipes, side, snack, untranslated, vegetarian. Bookmark the permalink.